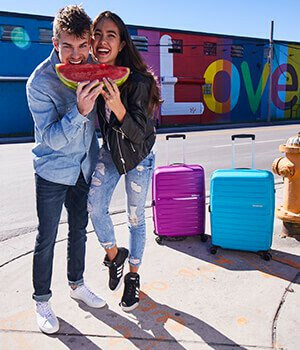 Offering over 100 litres of volume and weighing only 4.2kg, this award-winning large suitcase from our groovy Soundbox collection is secure, resistant and light! The playful circular design with contrasting matte and shiny surfaces will really cause a stir whenever you travel. Expandability, fixed TSA lock, 4 smooth rolling double wheels and handy inside organisation all help to make this a first rate suitcase choice! N.B. Make sure you are aware of airline size and weight restrictions for hold luggage.